The concept of a shadow ban on Instagram is a much debated topic, and a controversial one. There is no real evidence that it exists and Instagram has never verified that there is such a thing. The shadow ban is a term used by the Instagram community as a description for when a user’s posts is not showing up under hashtags, which it would normally do. The “shadow” label is due to the fact that to the user, everything looks normal, but if you look at the posts from a non-following account, suddenly posts do not appear. If this “ban” has hit you, only your followers can see your posts, resulting in a significantly lower engagement. There are basically two different explanations to why this happens. 1) Instagram is banning your posts because you have been engaging in some practice that Instagram defines as spammy. Like using the same hashtags over and over again, or using third party apps or bots to like or follow/unfollow hundreds of accounts. 2) It’s a glitch in the algorithm and you are just unfortunate to be affected. But about two weeks ago, the discussion around the shadow ban reached new levels. That was when many accounts got a message that they had to verify their telephone number to be able to access the account. Many even lost their accounts after this verification incident, others reported that suddenly months of posts were completely gone. Suddenly hundreds if not thousands of users reported that their photos were completely blocked from hashtags, for no apparent reason. I’ve seen users with very small number of followers, up to one account that has 219.000 followers, all affected by this. And it happened to me too. I noticed on the image below that only my followers were liking and commenting. So I looked at the photo from an account that doesn’t follow me, and that’s when I realized that I had been banned from these hashtags. That’s nine days ago, and I’m still banned. 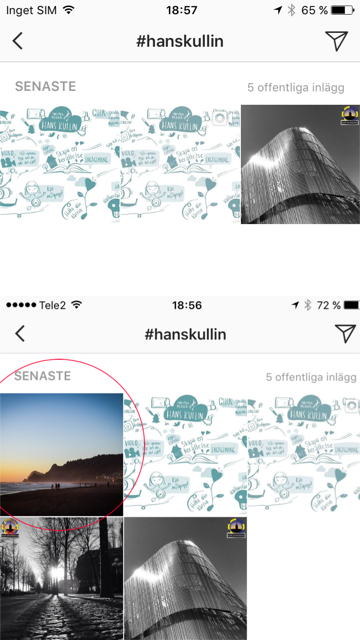 Here’s how my latest photo appears under a hashtag with my name (#hanskullin). Below is how it appears to me, the photo is visible under the hashtag. Above is how it appears from a non following account. The photo is now gone. 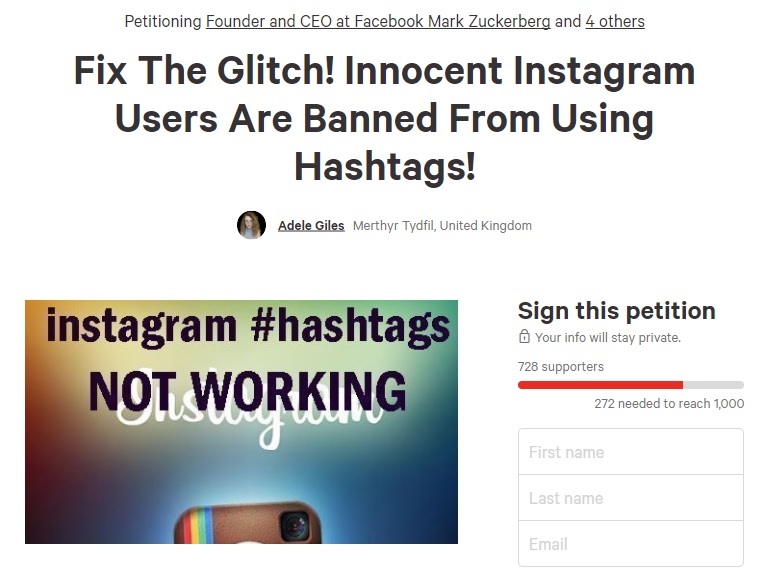 So far more than 700 people have signed the petition that will be delivered to Facebook and Instagram founders Mark Zuckerberg and Kevin Systom. Let’s at least hope that Instagram will acknowledge that there is a problem affecting innocent users and that they will find a solution.